- Now to the bargain price of 24,90€, instead of 29,90€. - Including IB Carptrack Flying Hookbaits 100g GRATIS! 10 well-orchestrated films by max nollert about the highlights of his most successful Carp trips in Germany and France in 2009 – 2011. With many Big Ones up to 25kg in big water bodies up to 4800 ha! 45 min. 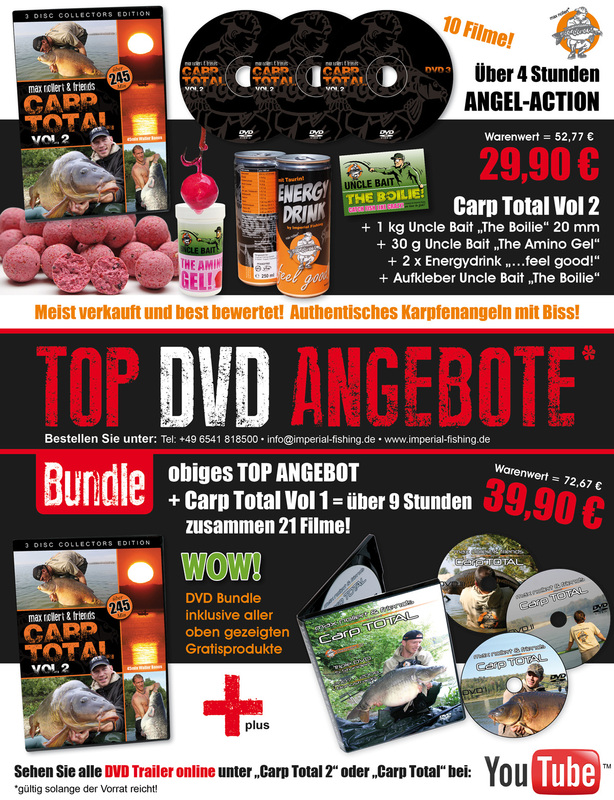 bonus film: active midsummer catfish angling out of a boat at the river Rhine with amongst others 5 PB´s up to 70kg. Watch during the whole film at exciting drills, successful fishing methods and techniques, tactics, challenges and how to deal with them. Explained and demonstrated live at the water, by Max Nollert. No contrived scenes. This DVD will inspire a sense of adventure in you! The films will take your obstructions of big water bodies, show you the loophole for difficult situations and be an inestimable guidepost for your future fishing trips. Use the experience of max Nollert for your catching fortune! Make a one-off payment of just 99€ instead of129€! You would like a little foretaste?